HomeShort Stories‘No Smoking’ – The Best Resolution! 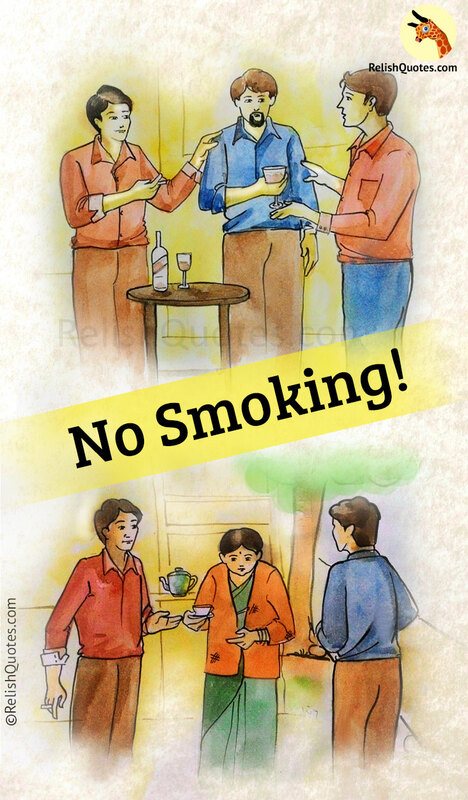 ‘No Smoking’ – The Best Resolution! “We forgot the cigarettes, come let’s go buy a couple of packs”, Aryan urged me to go with him. We had already settled down in Aryan’s room after bringing a full bottle of Teacher’s whiskey, some snacks along for the boozing session, and also a cake. It was New year’s eve after all! “Two packs of Lites please”, Aryan gave the money to the vendor and stood tapping his feet onto the ground, waiting. “I don’t understand what you get by smoking that thing. Everybody knows it may kill but still continue to smoke”, I opined. “Don’t start off with your regression now! It’s not like I’m asking you to smoke. Anyway, since you’ve brought it up, it’s my moral code to stand for my fellow smokers. Let me ask you, you know you may get killed due to an accident. So you will stop traveling?” Aryan asked. That was Aryan, you could never argue with him. He’d come up with something of that sort which you’d not be able to answer even if you felt the comparison was completely inappropriate. “Sorry bro! You carry on”, I surrendered. “Now that’s like a good friend!” Aryan tapped my shoulders. Once he collected his cigarettes, we got back to his room. “It’s already Eleven o clock”, Rohit complained when we got back. “No more roaming around. Let’s lodge ourselves in this room. Pass me the cigarettes”, Akshay demanded. All of us settled on the bed and my friends started pouring down alcohol into their glasses. I did feel left out of that, but expecting the boozers to make a peg of Maaza for me was stupid I realized. I made my drink and for no reason joined them for the cheers. “Yeah, cheers to the non drinker too!” They said, making fun of me. Turn the music on bro”, Aryan asked me. Yeah, I was an outcast and I would have to do all the works now! “Make your New year’s resolutions”, I asked them while they were about to cut the cake at midnight. They were all drunk by now and were in no place to pay heed to what I said. However, Aryan spoke. “Okay, my new year’s resolution would be No smoking“, he said and immediately lit a cigarette. The other two laughed and repeated the same. I didn’t try to fill sense into these people, I knew it was pointless anyway! It was 4am and these people were not yet done. They drank peg after peg, danced, talked all sorts of worldly issues, Akshay even called up his ex to put out his excruciating pain of breakup (Yeah, that’s how they feel after alcohol goes down) and Rohit had puked twice already. But I never got bored. For one, drunkards are fun to be with since they do all sorts of crazy stuff and you can just sit there and watch the show, two being Aryan. Whenever he got drunk, he spoke so well about stuff, you could just sit and listen to his standup without feeling drowsy! “Let’s go for a walk”, Aryan said, out of nowhere. A walk at 4am did sound like a good idea to me. I did need some fresh air after passive smoking for hours together. Rohit said he’d want to hit the sack. Akshay agreed upon the idea and we all set out on a walk towards the National highway. Yes, it was close to his place! Once we hit the highway, Aryan seemed like he was looking for something. We walked for about ten minutes when Aryan found a small Tea stall at the side of the road. Well, it wasn’t exactly a tea stall. You know that mobile thing vegetable sellers use? That was the thing. “Tea anyone?” Aryan asked, and all of us nodded a yes. When we got to the stall, we saw an old woman who was probably in her sixties brewing tea all alone. She did have other things like biscuits and buns. “Do you have cigarettes?” Aryan asked the lady. She gave the both of them a cigarette each after Aryan asked for two. “Idiot, this is why you came for a walk?” I asked. “Yeah bro, the cigarettes were over. We will buy tea, chill!” He said. We were sipping on our tea and they were dragging puffs. I looked at Aryan only to notice he was deeply observing the old lady. That’s when even I took a proper look. She was wearing a sweater that didn’t have buttons. She had used safety pins to hold the sweater together. The sweater wasn’t in a good condition either. It was all ragged and shabby. We all know how cold it will be at that hour early in the morning. Aryan started speaking to her. He asked her questions and when she had answered all of them, Aryan looked intense. The lady said she usually woke up at 3am and pushed the mobile tea stall all the way from her home which was about a kilometer away. She had an ill husband who was always on bed. Her children had forsaken her, which shouldn’t come as a surprise in our place. She generally made a profit of about two hundred rupees everyday out of which she had to give fifty rupees to the police. When she said her story, tears had welled up her eyes and Aryan had gone mute. He seemed moved. He bought about five packs of biscuits and five buns. We left the place and started walking back. That’s when Aryan chose to sit at the side of the road. We sat next to him. And we noticed Aryan crying. We had never seen him cry! Vehicles passed before us and we just kept staring at the road for a long time until Aryan spoke. “She makes about 4000 rupees a month, and we just spent that money yesterday night partying. The cigarettes we smokes yesterday is twice the money she makes in one day, in that bone chilling weather. Such a waste, all of it! Such a waste” Aryan cried like a baby on my shoulders. I didn’t speak a thing. I just held onto him until he was done. Akshay seemed to be in a deep thought as well. Once Aryan was done, he spoke up again. “I don’t want to smoke. I don’t want to waste money like this while people are struggling for their daily bread. This money which is already going wasted can be used to do some good. Neither am I drinking. I’ll save the money, and use it for some real good reason!” He said and threw away his lighter onto the road. Early in the New year’s morning, true realization had happened. It was a resolution that actually meant something. After a week, I felt like taking a walk early in the morning. I chose to pay a visit to the lady and drink tea. When I went there, I couldn’t stop myself from smiling. She was wearing a new warm sweater!